Ingela and Snoddas greet “judge” Låtta. All hunting trials and working tests include greeting the judge and/or the shooter. 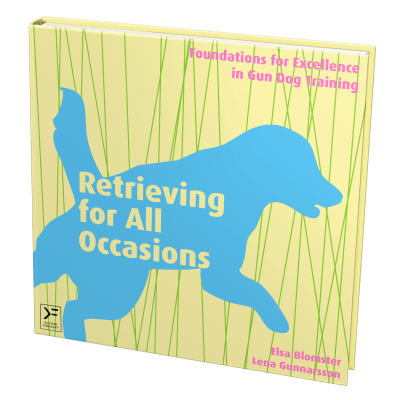 Often the dogs learn to associate trials and competitions with something that is really funny – which means that the dogs’ expectations might be very high and that the dog might find it difficult to sit calmly or walk properly by your side. 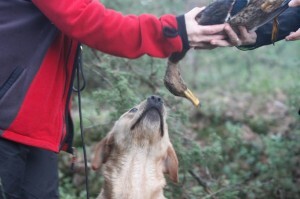 To prevent this from getting a problem, we start right from the beginning to practice situations when people come up to us and greet us and situations when the dog walk by our side when we follow different people – that way the dog will learn that no matter what happens she will be rewarded when she stays close to the us. 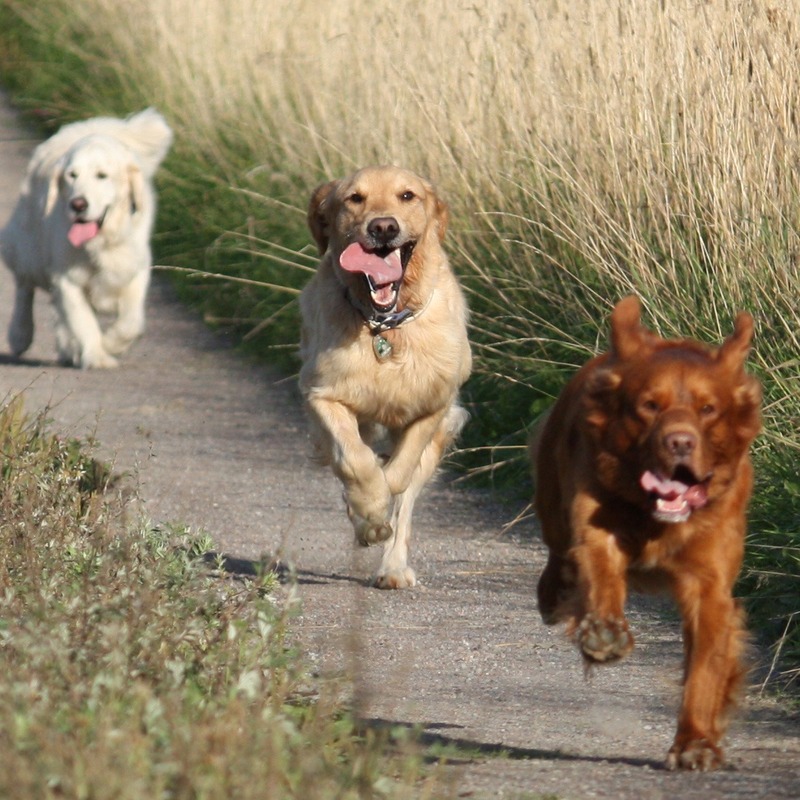 A very good basic exercise for all training is that the dog can play with us, even if there are distractions around us. 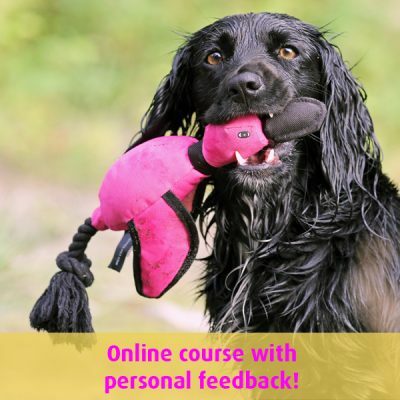 If we know that we can get the dog to play with us in such a situation, it is a lot easier for us to teach the dog to ignore disturbances in other situations, such as when the dog walks by our side, or when she returns to us with a dummy. We simply start by playing with the dog in all sorts of different environments and then we make it more and more difficult. We can for example ask a friend to clap her hands and say “hello” or play with a ball, we can play with the dog when other dogs are around her, or we can put something very interesting on the ground. If the dog gets disturbed and stops playing it is a good idea to play with the dog in a more interesting way (drag the toy along the ground, talk to the toy, run away from the dog, and so on). It is also easier if the distraction is a bit further away, but it is important not to give up. If your dog can play with you without any distractions you can also get her to play with you with distractions, if you do it gradually. When we want to start training our dog as if it were a trial and the dog sits by our side, we start by rewarding the dog just because she sits by our side. 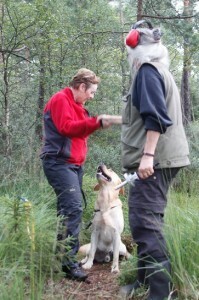 Then we ask a friend to be an assistant and approach us and reward the dog if she still sits by our side. If the dog should get up, the assistant should just turn away and ignore the dog. If the dog has left her position we just ask the dog to come back and sit by our side again (if the dog can’t get back into the position we entice the her with a tidbit, in this situation, we want to train steadiness, not that the dog should come back in position). Snoddas sits by Ingelas side when she hands over the game to the judge. When the dog can remain by our side when the assistant is approaching, we can let the assistant come all the way to the dog, talk to us and finally shake our hand. Be sure to reward the dog as soon as you see that she controls herself. We want to have at least four out of five correct behaviors before we move on and make the exercise more difficult. The dog should be rewarded for the correct behavior – that she remains sitting by your side – more times than not. Don’t forget to ask the assistant to talk to you and greet you. Many judges want to know the name of the dog and might say, “Hello, hello, what’s this beautiful dog’s name?”. 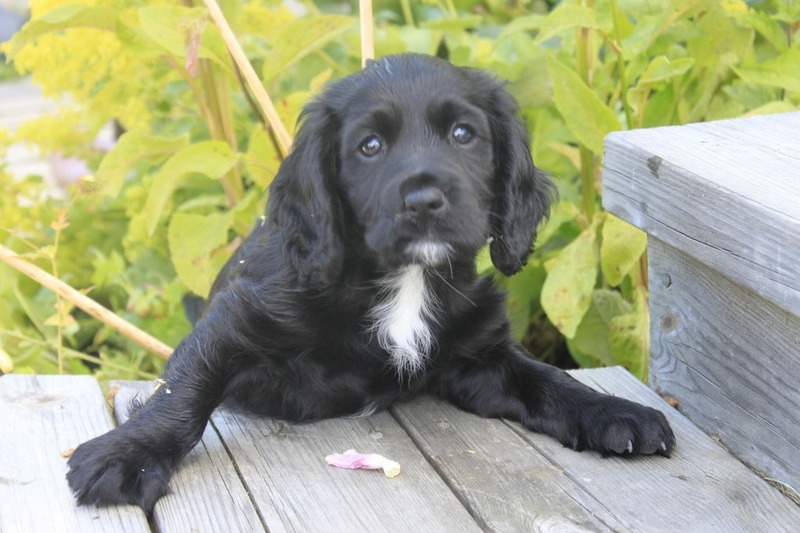 At that point you must have taught your dog to remain in position when the judge and you say the dog’s name (otherwise you have to rename your dog to “sit” – I have thought of doing that a few times…). 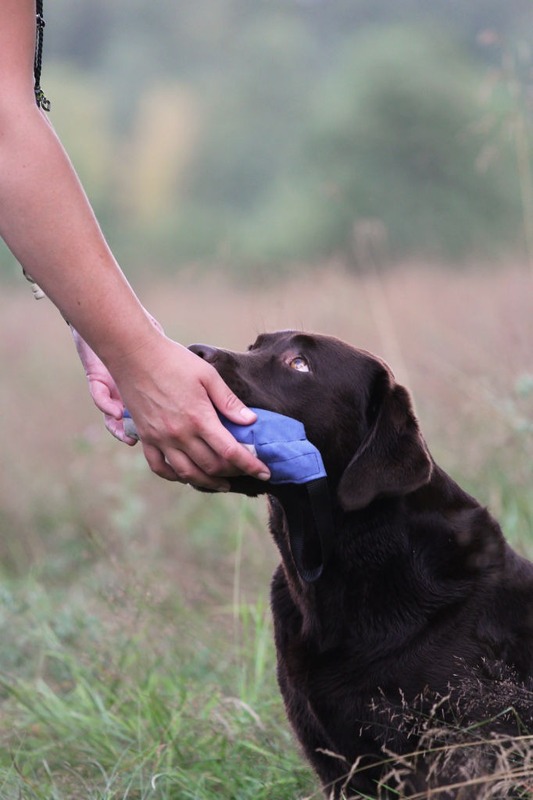 We also want to be able to hand over an object to a person who comes up to us and that the dog remains sitting by our side (and also receive an objects from a person, although it doesn’t usually occur at a trial). 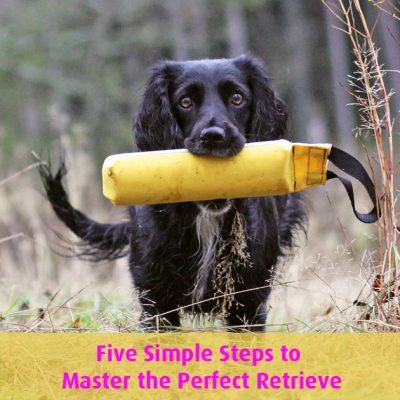 We train these situations in exactly the same way; we reward the dog when she sits by our side and controls herself, and we ensure that the dog does not get rewards if she moves away from the position. You can ask your assistant to give an object to you. The assistant approaches you with the object and walks up to you. If the dog stands up before you have rewarded her, the assistant should take away the object (and turn around if that is needed). If you train it like that the person’s outstretched hand and the object will be a signal for the dog to sit by your side. The dog should also be able to walk by your side when you walk behind a person and this you can train at the same time. When the assistant has greeted you he or she can for example say, “Follow me, please” and walk away again. Sometimes you follow the assistant and sometimes you stand still – all this to teach the dog that she should listen to you and not to the assistant. You can also follow the assistant for a little bit and then turn and walk in another direction. Here you can watch a short film that shows this exercise.